1 Divide the dough in two and round both pieces of dough. 2 Start stretching the dough with your fingers, working around the dough, pulling as you go. 3 Start rolling the dough, flouring as you go, to prevent sticking. 4 Stretch the dough with your fingers. 5 You may need to stretch the dough more than once, letting it rest in between. 6 Form a border by pushing along the outside rim ofthe dough with your fingers so excess dough accumulates and forms a rounded edge. 7 Check the size of the dough with the pizza pan. 8 Roll the dough up on the rolling pin and then over the oiled pan. Press the dough around the edges inward to help form the mounded border. 9 Trim the dough by rolling over it with a rolling pin - if the pan has a rim - and cut away the excess on the edge. If your pan doesn't have a rim, cut around it with a knife. Leave the border you've made inside the pan so it isn't cut off. 10 Press the dough into the edges of the pan, forming a border as you go. Brush excess flour off the dough and brush the dough with olive oil. 11 11.To make pizza margherita, prepare the ingredients and arrange them on the pizza dough. 12 Coat the basil leaves with olive oil so they don't turn dark when you slice them. 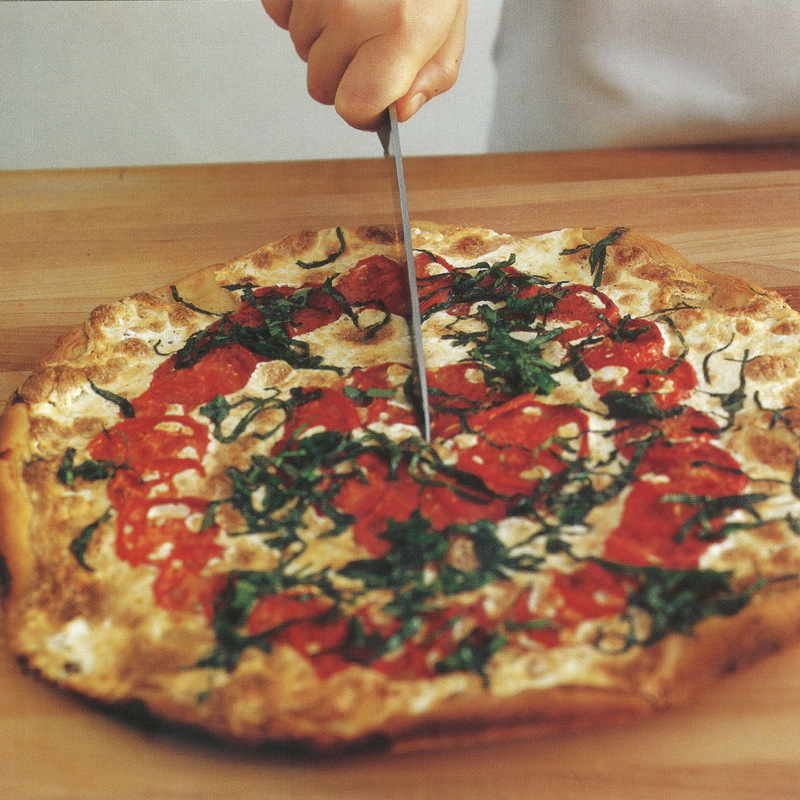 13 When the pizza is almost done, cut the basil leaves into thin strips and sprinkle over the pizza. Brush two 11-inch pizza pans with olive oil. Divide the dough in half and form each half into a ball, shaping the dough with your fingers, pressing and turning, until the dough is at least somewhat round. Put one ball on each of the pizza pans. Put the pans in the refrigerator for 15 minutes. Shape the dough by pressing on it and stretching it with your fingers or with a rolling pin until it covers the pizza pan. You may have to press and stretch the dough 2 or 3 times, with a 15 minute rest between each time to get the dough to cover the pizza pans. Press up against the edges of the round from the inside to form a border. Brush the dough with olive oil. Preheat the oven to 500°F. Coat the basil leaves with olive oil, roll them up, and slice the roll so you end up with thin strips. Arrange the tomato slices and cheese slices on the pizza. Bake for about 15 minutes, or until the crust is brown. Just before the pizza is done, sprinkle the basil strips over the top, and bake until done. Follow the recipe for pizza Margherita, replacing the tomatoes and mozzarella cheese with Roquefort cheese and walnuts. Crumble 8 ounces Roquetort cheese on top of the dough, then sprinkle over 1 cup coarsely chopped walnuts. Bake for about 15 minutes, or until the crust is brown.